Labour day is celebrated big in Colombia, with a capital B. 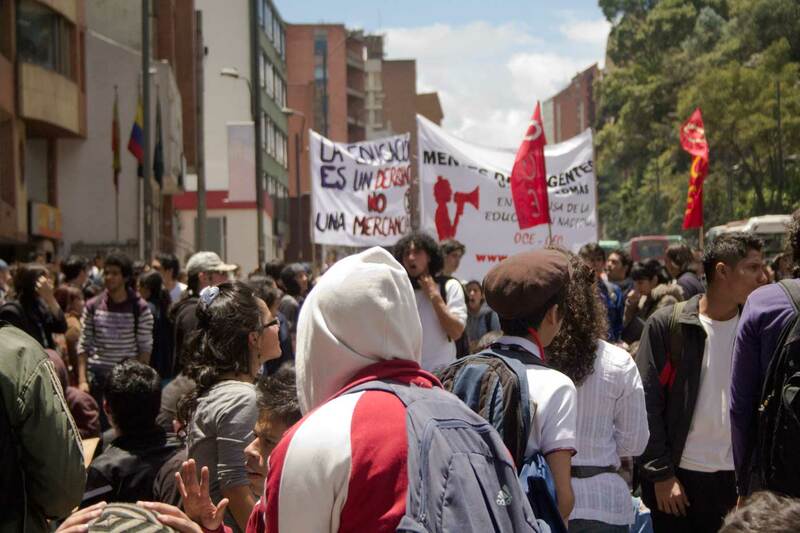 Only in Bogota, 25.000 people hit the street to protest against the government of seated president Juan Manuel Santos Calderón. 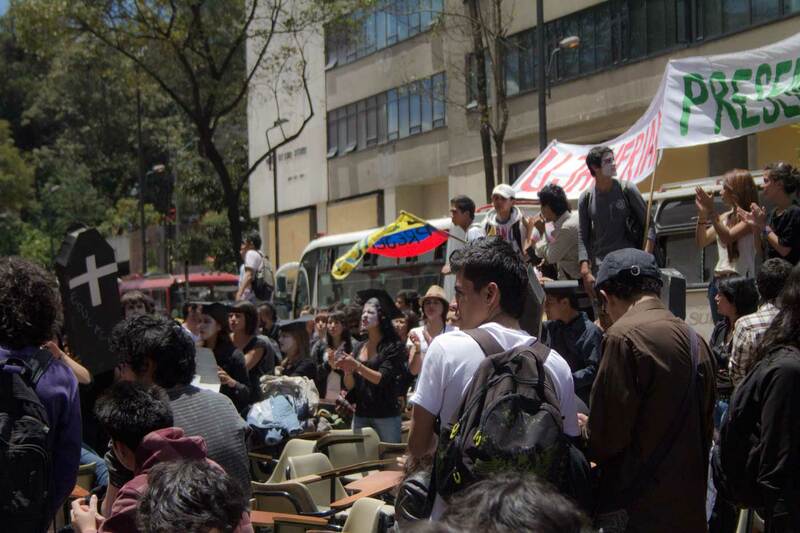 From students to taxi drivers and even neo-Nazis, we saw them all pass the streets’ catwalk. 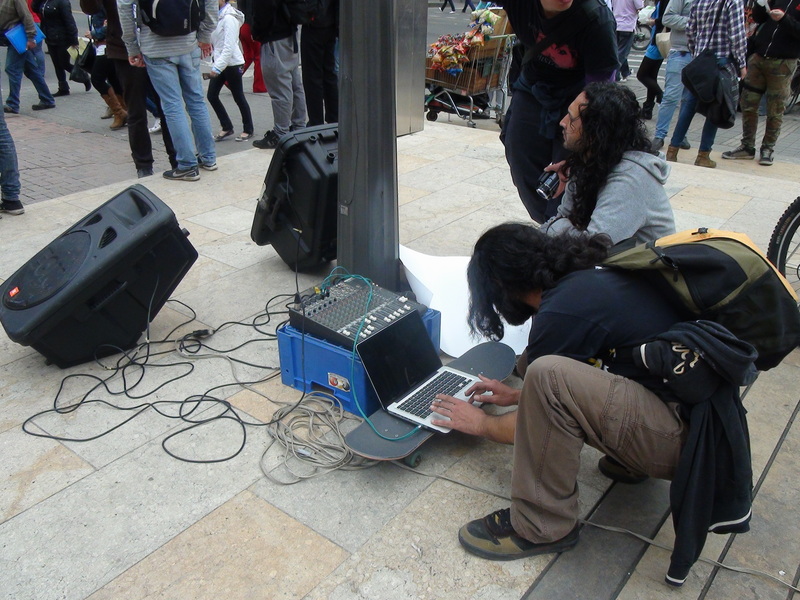 Antena Mutante had planned an urban intervention on Plaza de las Nieves, one of the squares of Bogota, together with SurdelCielo, an initiative of young rappers. "Heroes exist in Colombia, they don't use weapons." The idea was as follows: At 8 AM, we would all gather on the square to set up the installation, DJ turntables, waterproof tent (it rains a lot), and of course, the computer and cameras. The performance would be filmed by 2 cameras and then be transmitted live over the Internet. The day before, I went with the Antenas to one of the syndicates on the square to borrow their Internet connection. Other than in the Netherlands, WiFi is not yet available on every corner of the street. The location of the intervention was therefore dependent on the accessibility to Internet. Talking to Jimmy earlier, he told me that all their events were dependent of this fact, and some agreement with either an organization or friend was needed in advance in order to transmit. It occurred to me that tactical media, at least in Colombia is restricted to technical possibilities available. Especially when interventions are politically charged, you can imagine that not all organizations are happy to offering their services. And while setting up the installation, the laptop happened not take the Internet signal very well, which prevented the MC’s to rap online. To make matters worse, the computer crashed which made transmission completely impossible. 1 hour later, Jimmy returned with another computer and the transmission was successful for the rest of the day, but I realized then how fragile such interventions are and how one little error can mess up a lot. Media activists will always be restricted and limited to the possibilities that technology brings along and they will always be somehow dependent on neo-liberalist practices. Be it not for the hardware itself, then it will be Internet access, cable companies, etc. I added a small impression of one of the tensest moments of that day. Most of the time it wasn’t as bad, but in waves people got aggressive with the police. I ate a good amount of tear gas, but in the end, it was worth the experience. In the video, note also the music, where Rastro kept singing only a few metres away from the violence. 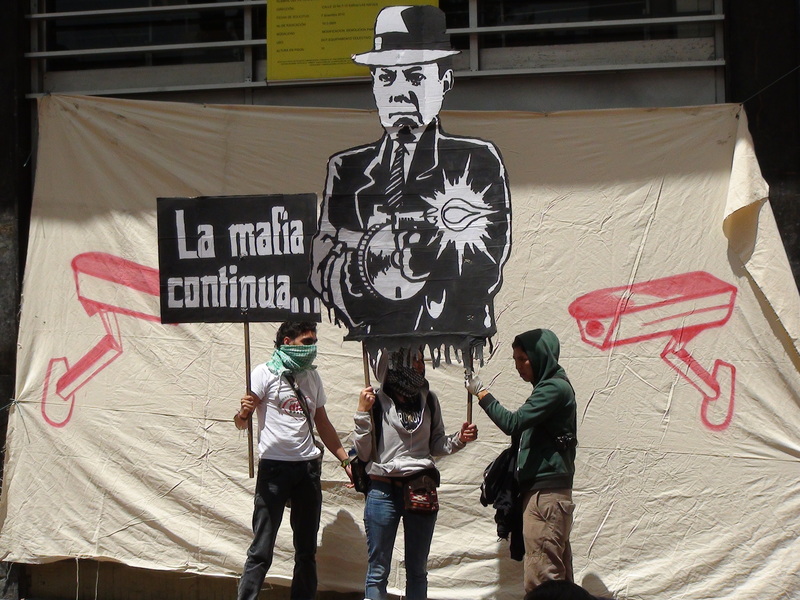 Bogota – 1 de Mayo – Antena Mutante and Sur del Cielo from Fei An Tjan on Vimeo. 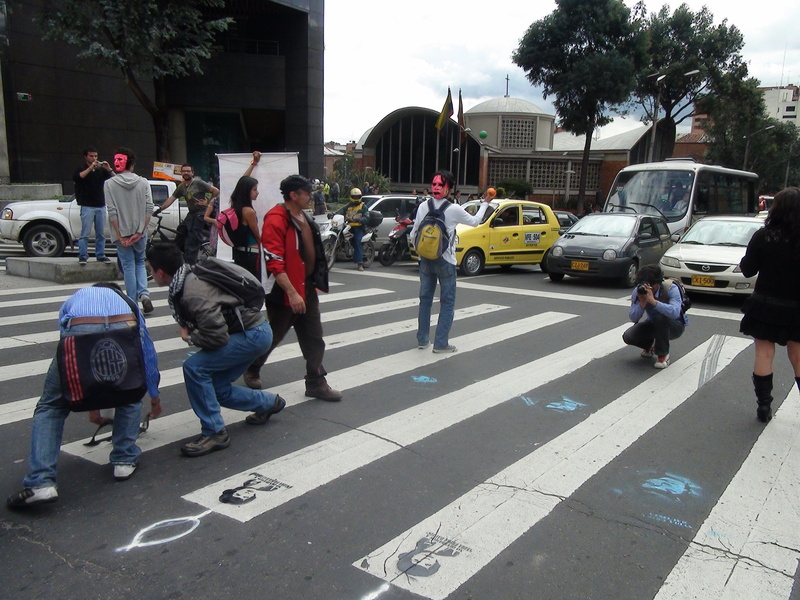 In my second week in Medellín I spent some time on my project with Hiperbarrio. 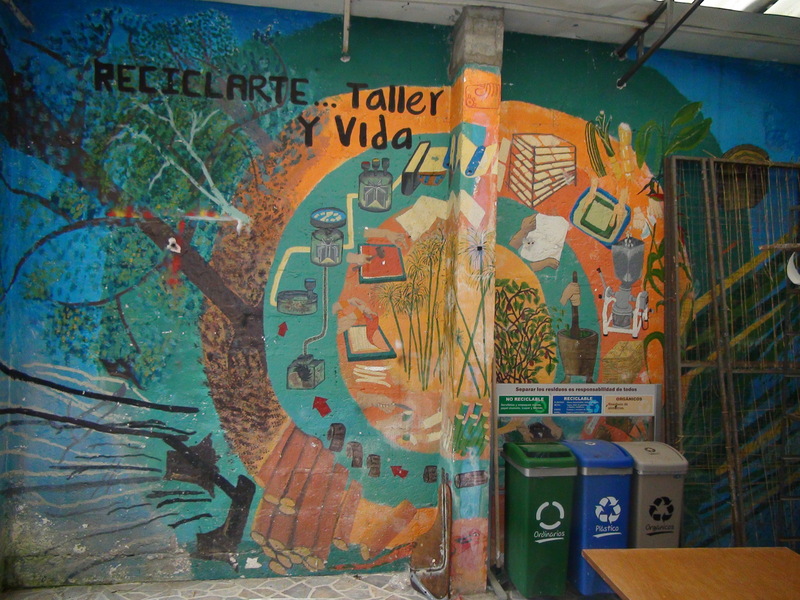 The organization tries to reach social inclusion through means of digital media in several depressed neighbourhoods in Medellín. By giving workshops in photography, blogging, podcasting and the use of free software, they try to keep the youngsters off the streets. Their methods are based on the idea of sharing knowledge, where anyone that can add something should give a workshop to the others to share that knowledge. Free culture therefore plays a very important role in keeping the organization sustainable. 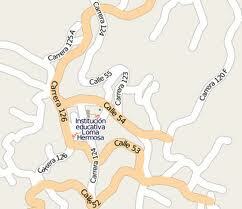 This Tuesday I went to La Loma, an area even behind la Comuna 13, about which I blogged in an earlier post. The problem with this area is that it has been home to about all the violence and corruption that you can think of. As the area is located in a gray area of what is considered La Comuna 13 and San Cristobal, order and state presence have been largely absent. 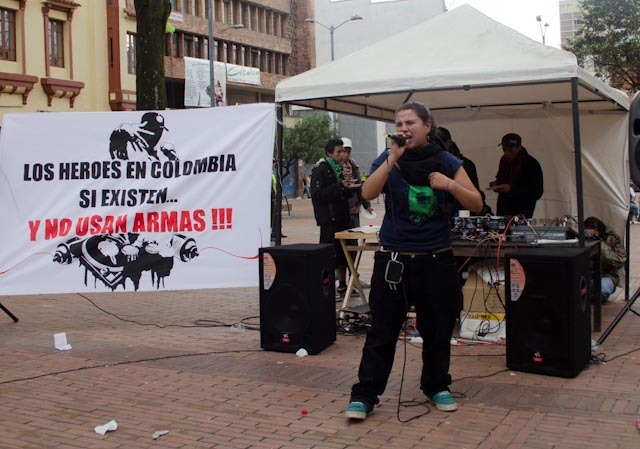 This led to the forming of gangs, paramilitaries, left wing insurgents such as FARC that have long used the area for their drugs-related businesses at the expense of the inhabitants. When I arrived everything seemed calm, but Henry, the coordinator of the program knew to tell me that this could change any day. In the library of La Loma I speak with Andrés, an ex gang member that has now dedicated his life to his work at Hiperbarrio. I’m guessing he is around my age, 23, 24 maybe. Hiperbarrio, in which he enrolled 2,5 years ago, saved his life he says. Before that he was mainly involved in the gang life trying to ‘protect’ the ‘invisible borders’ that mark the region of La Loma. In Hiperbarrio he entered another reality where it was about collaboration, learning and being critical to the society they live in. He is now one of the coordinators that implements this program in another area in Medellín, using one of the public libraries as their weekly meeting points. Talking about cartographies also reminds me of the final results of LabSurLab. I know I already went a little too excessive over this, but I can’t help sharing one more video. Most of the participants were already involved in similar projects across the world such as AntenaMutante, Platohedro, No2Somos, Cartografías Sonoras and Hacktitectura to name some. During my time waiting for the project to advance, I had a talk with Jaime Mahmud lópez and Patricia Velez Fernandez, two of the creative minds behind FRACTALAB. Latter is focused on a multidisciplinary idea to create open space for the youth in the coffee region of Colombia (Eje Cafetero). In this interview (in Spanish) Patricia explains why they have chosen to work as they do. Through art projects and the use of public spaces, they try to generate a view that is different from the mainstream. One of the projects Patricia talks about is for example 5 pieles (5 skins), referring to the different layers that define our existence. The first one being our own skin, the ‘I’, second are cloth, shoes and things you use to carry yourself, the house you live in and the architecture that surrounds you is the third skin, the fourth one is the social environment you live in and the last one is the universe. This idea was based on the idea of the Austrian artist and architect Hundertwasser, who exposed his vision on the world with this theory and our relation to the external world. FRACTALAB accordingly pursues that idea by creating space to exchange ideas and concepts, to support innovation and serve the community better. Digital media in that respect serves as a great tool as it has the ability to connect people, is very much from this time, it’s affordable and has the ability to connect universally and immediately.The inclusion of the citizen seemed to be an important stance of their organization which was also one of the themes of the cartographies, as well as during the event of LabSurLab as a whole. Day one in Colombia promised to be a busy day with the event of ‘LabSurLab’ in perspective. LabSurLab is a gathering of different worldwide Labs taking place in Medellín first time this year. From the 6th of April to the 12th of April different projects will present their work and exchange ideas on subjects such as community improvement, hardware recycling and open source applications amongst others. As the round tables, workshops and seminars were taking place in different cultural venues and squares in the city, and the information booklet did not present exact locations and time, I wasn’t sure where to start looking for my contacts of AntenaMutante. Following the LabSurLab guide, our best shot was at the cultural center Morávia, which was located about 45 minutes away from Ellen and my apartment. Unfortunately Antena Mutante was not attending the round table of that day, but was doing a cartography workshop somewhere in a very sensitive area of Medellín, called Comuna 13. This neighborhood was marked by Operación Orion (2002) under Alvaro Uribe, Colombia’s former president in order to drive out leftist insurgents FARC, ELN and CAP. It held that the area from that point on was under military control in order to restore peace and tranquility. But even though the amount of violence has reduced since than, one sentence I heard that day stayed in my head: “as long as there are weapons, one does not feel safe”. When working with the cartographers, the latter became quite clear as the militias reacted quite aggressively when they noticed they were being filmed. And the fact that they were wearing rifles and guns did not make it any better. The idea of the workshop was to map out different viewpoints, different ideas in order to offer resistance to the oppression and bring to light themes such as poverty, displacement and economy. It was about showing memories, giving a different view of the problematic and maybe most importantly, present a viewpoint of the people’s perspective instead of that of the mass media. At 6 o’clock, the 4 different groups that went into the neighborhood to collect footage came together to discuss their findings and come to some common conclusions. What I found especially interesting is the way this meeting was organized; even though there were three leading figures in the group, all opinions and suggestion were carefully taken into account. The final idea of how to continue the work resulted out of a long discussion and referendum where many pros and cons passed the table. The ‘leading figures’ could well be seen as discussion leaders, rather than the ones with final authority. Even when things were said that were not always relevant or useful, it most of the time led other people to come up with an appropriated idea. It was chaotic, slightly unstructured, but effective. This, I think was also characteristic for the whole organization of LabSurLab, where the organization seemed to be fluid, with no rigid planing, but still a clear organization that often went from mouth to mouth rather than a set schedule. All in all, this was a very instructive first day with already loads of information to process and I can’t wait what more will come!